It’s said, there’s no place like home – and we couldn’t agree with it more. A tiring day later, the warmth, serenity and the comfort our house offers, rejuvenates our very soul. However, true sense of peace can only be obtained when you know the place you love the most, is protected by all means. By protected, we aren’t referring to the decade-old lock you’ve got on the door nor the outdated security system installed in your premises. The modern-day security scenario has undergone a huge metamorphosis from what it was a few years ago. If you’re still stuck in the past, there’s a huge chance that you might be the next victim of a break-in or burglary. Take proactive steps today, and contact a home security locksmith. High-security locks: Bid adieu to the conventional and embrace the new. 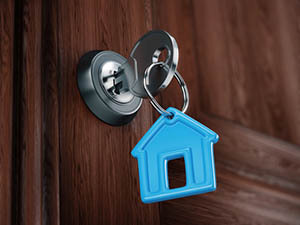 Our home security locksmiths will assess your property and suggest suitable locks, based on the requirement. There are keyless solutions, combination locks, electronic locks, heavy duty padlocks, sensor-based locks, voice-activated systems and more that you can choose from. Rekeying for better security: Do you have any idea how many people have access to your keys? You could have handed out spares to your neighbor, the gardener, the babysitter, a former tenant – and even if they did hand back the keys, you can’t be sure that they haven’t copied it. Rekeying can help you regain key control and choose who you provide access to. Securing all access points: The front door isn’t the only entry point into your property! There might be a window or a patio door or your garage that could be used to access your premises. Our home security locksmiths will analyze every single entry point and bolster their security by installing sturdy locks, window guards, safety grills and more. Ensuring excellent door hardware : No high-security lock can save you, if the door on which it’s installed is itself a weak link. Any damage or poor build quality will make it an easy target for miscreants. Our experts will carry out any repairs and also upgrade the doors by installing steel or wooden variants. For 24/7 assistance from our home security locksmiths , dial 813-280-8330 !